Students in Melbourne, Australia out on strike on November 30, 2018. Over the past year, Fernands, now a sophomore in high school, has connected with other young people around the country and the world who grasp how dire the climate crisis is. And today they’ll be taking to the streets in at least 105 countries. 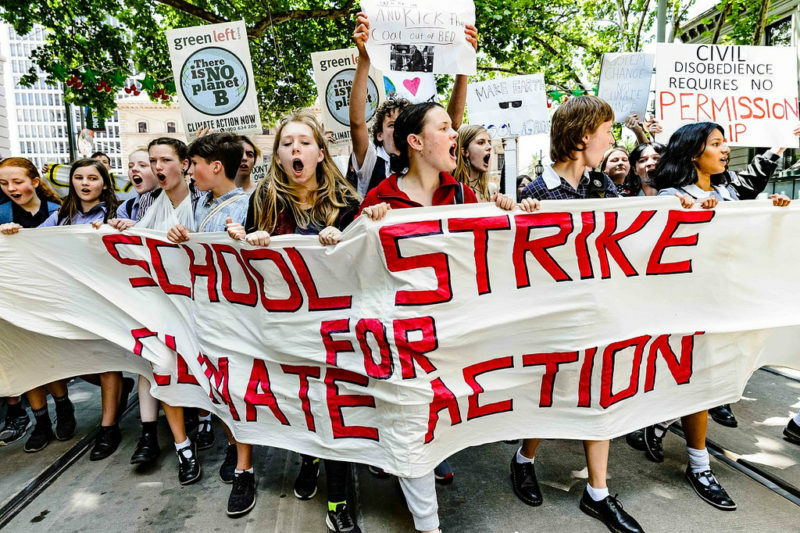 In the U.S., youth will strike in more than 100 cities, taking time off from school to demand radical legislative action to combat climate change and a transition to a 100 percent renewable economy. Berfond, who has been terrified about climate change since elementary school, has found relief in sharing some of the anxieties she used to keep to herself with other activists. “Every time the winter is rainy and there’s no snow, I get really upset,” said Berfond. “I talked about that in a Sunrise meeting recently — how I remembered winters being different. And every person around my age said, ‘Oh my god, I feel the same way.’” The discussion eased some of the burden. “Saying ‘I’m scared’ publicly is cathartic,” said Berfond. Tierney left — in tears. But girded by her fellow activists and her conviction that someone needs to call attention to the environmental catastrophe the adults around her are ignoring, she spent much of the next few weeks planning Friday’s walkout.